Numerous PCR assays have now been developed in a variety of resistance genes discussed in this review. [6-10] Each PCR assay uses a pair of primers, which can be the same as those used for DNA-DNA hybridization. The template may be purified DNA, proteinase-K lysates of whole bacteria, and/or direct patient materials. The PCR assay can use direct patient material, if from a normally sterile site, as the source of the template to determine whether a particular antibiotic resistance gene is present in the sample without growing the bacteria. Using nonsterile sites as source of material is not desirable because most of the genes discussed in this review are commonly found in commensal species and will be positive. Initially, the PCR assays detected single genes. We then modified our two primers to look for tet(M)/tet(O)/ tet(S) and the tet(K)/tet(L) PCR assays. [6,11] Which gene was amplified was determined by hybridization with an internal probe specific for only one of the three genes. More recently, multiplex PCR has been developed where each tet gene has it own set of primers and four to six different genes are detected in one reaction. [9,10] Each gene could be determined by the size of the PCR fragment. In all PCR assays, it is important to verify that the fragment visualized carries the correct sequences. Using one of these two methods is the only way to verify that the PCR fragment is correct. The multiplex PCR could be performed using a real-time PCR system, or even an automated system if available. Manual PCR assays are not well suited for quickly screening a large number (>100) of isolates per run. Both PCR and DNA-DNA hybridization methods can give false-negative results. To reduce the false-positive PCR assay, the author's laboratory uses an internally labeled oligonucleotide probe that is hybridized to the PCR products. This allows one to verify that the PCR product visualized is the correct one. Positive and negative controls are run with each assay. Reduction in PCR conditions may be used to identify related unknown genes. This is how the tet(37) gene was identified. Microarrays offer a new method for screening for the presence of tet genes. In this format, the specific gene probes are placed onto a solid substrate in a lattice pattern. The test DNA is then labeled and hybridized to the array, and specific target-probe duplexes are detected using a reporter molecule. Recently, we developed and tested a glass-based microarray using 17 tet genes. We initially tried to use the short probes we had developed for PCR and DNA-DNA hybridization (see above), but these were too insensitive to low copy number genes, which are usually found in natural isolates. They were able to detect cloned genes where there are high copy numbers of the target tet gene. We found that 550-bp PCR products used with purified DNA that was biotinylated were able to detect low copy numbers of tet genes. Each probe was printed as four replicated spots within each array. The target DNA was grown and DNA was extracted with a DNeasy Kit (Qiagen). Other DNA extraction methods were not adequate. 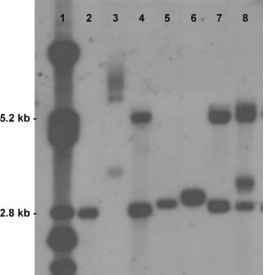 One microgram of target DNA was biotinylated using nick translation and then used. Detection used a Tyramide Signal Amplification, Alexa fluor 546, and microarray scanner. The detection threshold of three times the standard deviation above the standard negative signal intensity was set so that any signal over this threshold limit was called positive. Positive detection was confirmed either by PCR or DNA-DNA hybridization. The prototype assay demonstrates the feasibility of developing a high-throughput planar microarray for the detection of tet genes. However, the current process needs to be automated before microarrays can be widely adopted. One advantage is that a variety of different probes (< 10,000) can be incorporated on a single slide. Mutations that upregulate innate efflux pumps can alter the host's susceptibility. The mutation in the marR region of the chromosome enhances intrinsic resistance to a large group of antibiotics including tetracycline. The level of tetracycline resistance increases as the cells are grown continually in the presence of tetracycline. Another example is Neisseria gonorrhoeae, which have an mtrCDE-encoded efflux pump. When there is a 1-bp deletion of an A within the 13-bp inverted repeat sequence of the mtrR promoter region, the host cell shows a fourfold increased resistance to tetracycline, penicillin, and erythromycin.1-16-1 In N. gonorrhoeae, the chromosomally mediated resistance is often more common than plasmid-mediated acquired antibiotic resistance. Mutations in efflux pumps have been documented in a variety of pathogens and opportunistic species including Burkholderia cepacia, Campylobacter jejuni, Escherichia coli, Enterobacter spp., Haemophilus influenzae, Klebsiella pneumoniae, Pseudomonas aeruginosa, Serratia marces-cens, and Stenotrophomonas maltophilia. [1,18] Recently, 15 Tcr clinical isolates [minimum inhibitory concentrations (MICs): 2-64 pg/mL tetracycline and 1-32 pg/mL doxycycline] of cutaneous propionibacteria were found to have a cytosine instead of guanine at position 1058 in the 16S rRNA. This change was associated with increased tetracycline resistance. Mutations, which alter the permeability of outer membrane porins and/or lipopolysacchar-ides, can also affect bacterial susceptibility to tetracycline and other agents. How often these mutations occur and whether they are of clinical importance have not been established. At this time, mutations occur by sequencing the region thought to contain the base pair change(s).